I was reviewing the NPS scores for the big three Smart Home Providers, ADT, Vivint and Xfinity for Q1 2018. You might recall that ADT had some issues with a system upgrade in June of 2017 that caused a flood of frustrated users taking to the airwaves, dropping ADT’s already low NPS into the bowels of consumer hell. 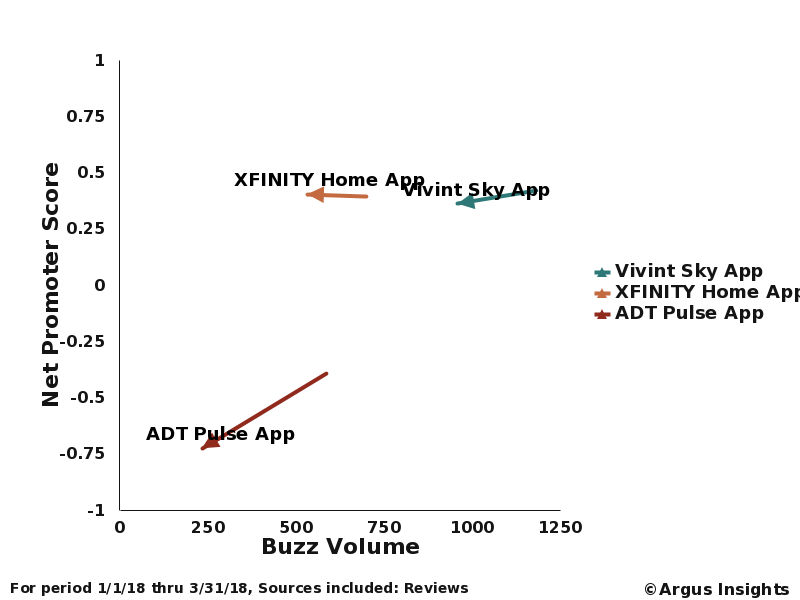 Checking around the holidays saw ADT start to recover, the the point of being on par with Xfinity and Vivint. ADT recovers from their summer of misery over the holidays, only to slide down into negative NPS territory. Notice that ADT’s NPS peaked in mid December, almost to an NPS of 25%. They actually were rated higher than Xfinity for the middle two weeks of December! Since then, ADT has fallen back into negative territory, frustrating users even as they lose them to other monitoring services or DIY solutions. Comparing major Smart Home provides Q1 2018 NPS to Q4 2017. Xfinity shows a drop in interest but happier customers than Vivint. While all providers saw a drop in interest after a surge in engagement over the holidays, Xfinity saw the smallest drop in interest. Vivint customers are still more vocal about their experience but Vivint’s NPS score dropped to 36% based on app reviews while Xfinity pulled ahead to an NPS of 40%. Both Vivint and Xfinity continue to threaten ADT’s prior dominance in the space even as Google, Amazon and Apple work to design DIY systems that dampen the demand of “Do It For Me” installations. We’ve got the data, updated continuously, on the entire Smart Home market. With literally hundreds of thousands of consumer perceptions coming in every quarter, Argus Insights sees the successes and failures across the Smart Home landscape and has the tools to help you profit from the lessons others have paid for with sweat, tears and market share. Let me know if there is a question you’d like an answer too.